Video Error: Having webcam troubles in Blackboard Collaborate? How do I get my computer ready for online paralegal classes? 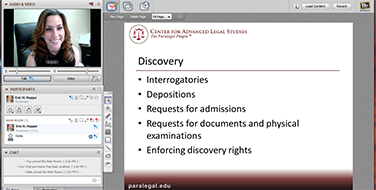 Online courses offered at Center for Advanced Legal Studies utilize two leading course management platforms; Canvas LMS and Blackboard Collaborate. These technologies require an initial configuration of your computer to work properly. Since these courses are presented in a live interactive format, participants are required to have a webcam and microphone, with a headset being preferred. Launch Firefox (preferred) or another compatible Internet browser. Your username is your email address, often the @paralegal.edu email issued to you during enrollment. Your initial password is the password provided via email notification during enrollment. You may want to change your password after logging into Canvas by selecting 'Account | Settings | Edit Settings'. Canvas sometimes uses small browser windows to deliver requested content. Some pop-up blockers incorrectly interpret these small windows as pop-ups and block them. If you have installed a pop-up blocker in your Internet browser, turn it off while using Canvas, or allow pop-ups for this site. After logging into Canvas you will want to organize your course list. Please see "How do I view my Canvas Courses" for more information. You should see and be able to enter a course titled Online Orientation. You will also see links to two pages: System Requirements and Configuration and Internet Connection Speed and Quality Tests. Please review these pages thoroughly prior to your Online Orientation. They contain information to help you test your Internet connection and configure your computer and Internet browser. If you have any questions or run into any difficulties, please reply to the email you received from the Director of Distance Education for assistance. We look forward to meeting you in Orientation and working with you during your time at the Center. How can I test the quality of my Internet connection? The better your Internet connection, the better your experience will be using Canvas LMS and other online resources such as Blackboard Collaborate. The opposite is also true. If your Internet connection is slow and/or has poor line quality, your experience will be diminished or certain features will fail to run. The following tools can help determine the speed and quality of your Internet connection. Most features of Canvas only require a 'fast' (broadband) Internet connection, which means the test should indicate your download/upload speed to be at least 4Mbs/1Mbs. Please be aware that cellular or satellite based Internet services do not generally meet these requirements. Also, wireless Internet connections are often of poorer quality than hard-wired connections. For wireless connections, it is best to be as close to your router or access point as possible during class. Blackboard Collaborate (used in Online Interactive Instruction sessions) requires not only a fast Internet connection, but also very good line quality. The line quality, ping, jitter and packet loss results reflected in the www.pingtest.net test can help determine the quality of your Internet connection. If your line quality is poor, you should contact your Internet Service Provider (ISP) to get the issue resolved.